Inscription on headstone of Hedley and Horace Miller, died February 1919, Bottesford churchyard. Article from the Grantham Journal, 8/8/1914: Horace Miller airgun pellet accident. Grantham Journal 15/2/1919: A Sad Homecoming - death of Pte William Hedley Miller. Grantham Journal 15/2/1919: obituary report of the funeral of Horace Miller. 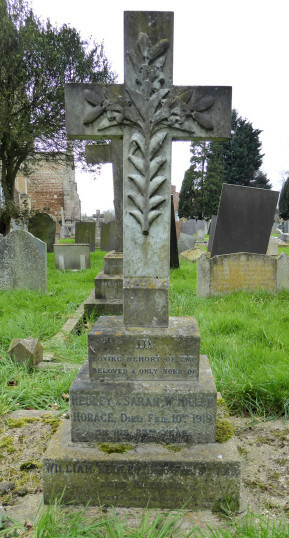 William Hedley Miller was the second son of Hedley Miller, a farmer from Stathern, Leicestershire, and Sarah Worthington Miller (nee Hallam) from Plungar, Leicestershire. He was born in 1898 in Grantham (Registration District), and died in February 1919, just 21 years of age. He is buried in St Mary’s churchyard, Bottesford. 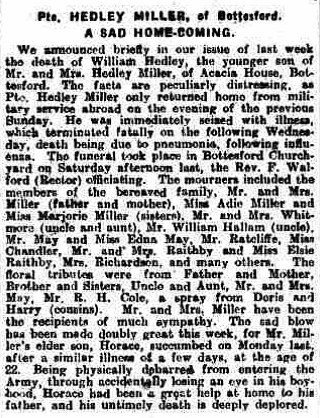 His father, Hedley Miller, was baptised 2nd April 1867 in Nottingham, son of William and Ellen Miller of Stathern. In 1881, he was employed as a farm servant on his father’s farm at Plungar. In 1895, he married Sarah Worthington Hallam, at Bingham. At the time of the census of 1901, the Miller family was at Hill Farm, Bottesford, a rather isolated location south of the Grantham Canal. 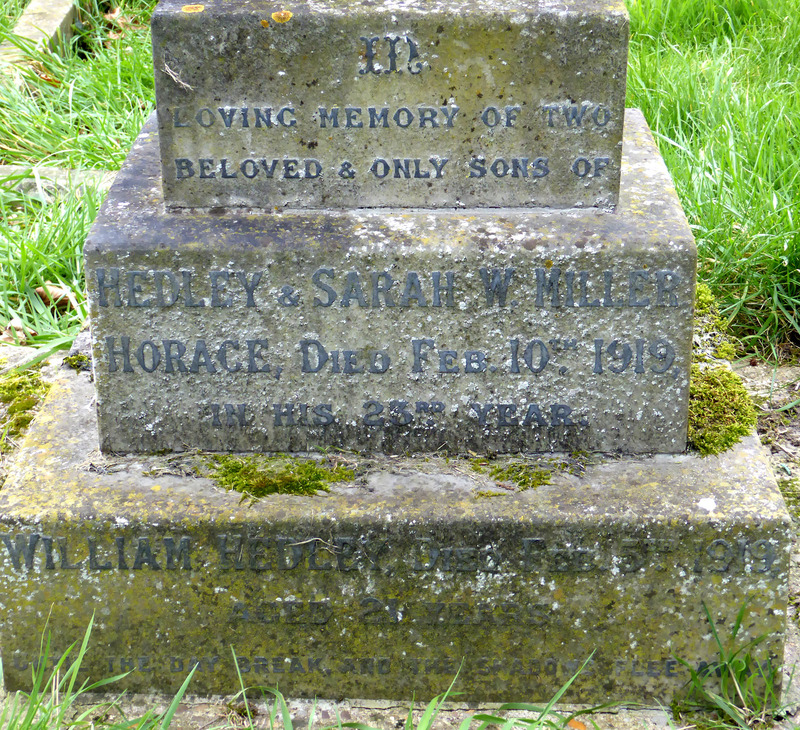 Hedley Miller was 34, and Sarah W. Miller was 29. They had two sons, Horace aged 4, and William Hedley aged 3, both born in Bottesford. By 1911 they had moved to 20 Belvoir Road. Horace, now 14, was recorded as a farmer’s son “on farm”. The other children, thirteen years old William Hedley, nine years old Marjorie Sybil and six years old Florence Adeline, were still at school. The address comes next in the Census sequence to that of nurseryman Arthur Robinson, and is therefore identifiable as one of the Edwardian villas on Belvoir Road at the southern end of the village, close to the bridge over the Winterbeck. They later moved to another Edwardian villa, Acacia House, located at the other (northern) end of Belvoir Road, close to the centre of the village. On the 8th August, 1914, on the eve of the outbreak of war, Horace Miller was seriously injured by being struck in the left eye by an airgun pellet while shooting small birds in the garden of the family home, and tragically lost the sight of the eye. He was unable to enlist, and spent the war years as a civilian. The accident was reported by the Grantham Journal. Few records of William Hedley Miller have been located. The Smith Family Tree (Ancestry public family trees) confirms that he was a Private in the Manchester Regiment, and that he died, 5/2/1919, aged 21. 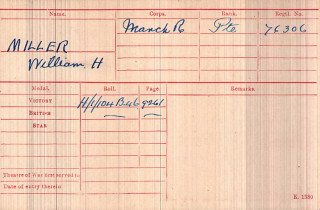 Information recorded in the Soldier’s Effects register indicates that he was Private 76306, 2nd Battalion, Manchester Regiment. 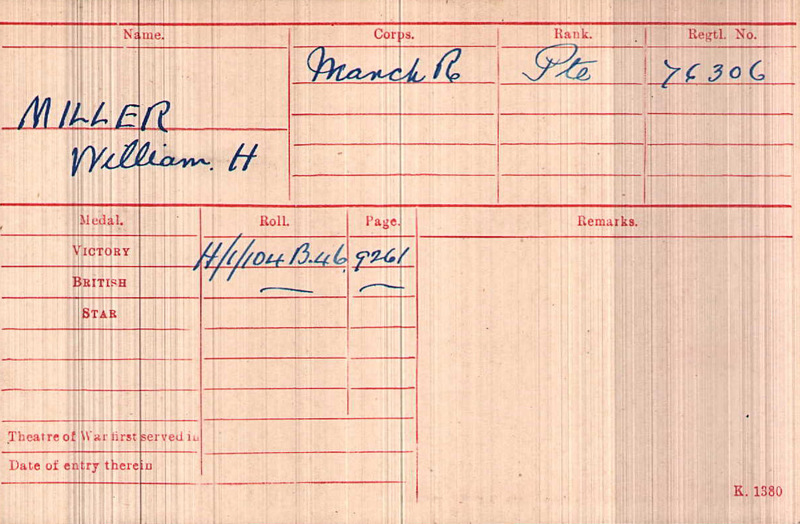 This records also shows that at his death he was owed 14s 4d and was eligible for a War Gratuity of £4. His total estate amounted to £48 3s. 11d. His Medal Index Card indicates that he was awarded the British War Medal and the Victory Medal. He did not receive the 1915-Star possibly because he did not join up until 1917, when he would have been 18. 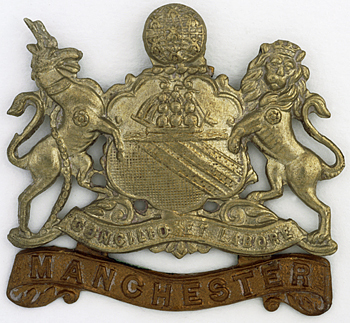 The Manchesters were one of the infantry regiments of the Regular Army, who had a training camp at Belton House, Grantham. The 2nd Battalion fought on the Western Front from 1915 to 1918, forming part of the 32nd Division. Their actions included several phases of the Battle of the Somme in 1916, and in 1918 the later Battles of the Somme, the Battles of the Hindenburg Line and the Battle of the Sambre. These bare facts do not reveal the tragic circumstances of Pte Miller’s death. He had returned home to Acacia House on leave (furlough), but was still in the army. Within a week of his arrival he had died of influenza. Then, less than another week later, his brother Horace also died of the same disease. The Grantham Journal faithfully but discreetly reported the events. 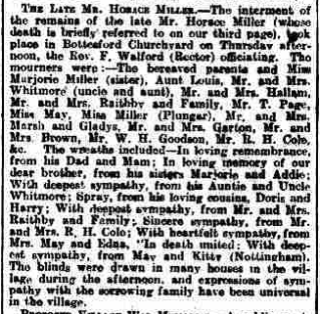 In Horace Miller’s obituary, it was reported that many blinds were drawn in houses in the village during the afternoon of his funeral and the family received many expressions of sympathy. His estate amounted to £202 4s 8d, and it was said that he had been a great help to his father during the war. William Hedley Miller’s departing cannot be described as that of a ‘survivor’, not least because he was still a serving soldier when he died. He cannot be in any way described as having enjoyed life outside the forces after the end of hostilities. Yet he did not die in the field of action, and is not named on the village War Memorial. It is indeed the case that he did not die in action or of wounds received while in action. Even so, it is quite conceivable that he had contracted influenza before he arrived back at Bottesford (unless either he or Horace Miller contracted the virus from someone else). It is highly likely that his death came about because of being infected before he returned home. Arguably, he should be seen as a war casualty, and his brother as an indirect war casualty. Much has been written about the 1918 Flu Pandemic, including the concise summary in Wikipedia. According to this, its frequent nickname of ‘Spanish Flu’ is misleading, deliberately so in that the wartime censors wanted to play down the strength and possible origins of the outbreak among the forces. Spain was neutral, and its king, Alfonso XIII, was gravely ill with the disease. Wikipedia goes on to add that recent investigative work has identified the troop staging and hospital camp in Étaples in Northern France as almost certainly the centre of the pandemic. A significant precursor virus, harboured in birds, mutated to pigs that were kept near the front. Whatever the truth, its tragic effects become very clear in Bottesford. Kelly’s Directories for Bottesford in 1908 and 1916 had listed Mr Miller’s occupation as farmer. In subsequent directories, Mr Miller no longer had an entry. Hedley Miller senior died on the 31st March, 1940, at his home Southview, High Street, Bottesford. He was 73. During his life he had lived in Plungar, at Hill Farm and Skegness before returning to Bottesford. His was a simple service in the Primitive Methodist Church at Bottesford, before his interment in the churchyard. He had three tributes, but had requested no flowers. Sarah Worthington Miller died at Mansfield in March 1960, aged 88. Died of influenza less than a week after arriving home on leave.